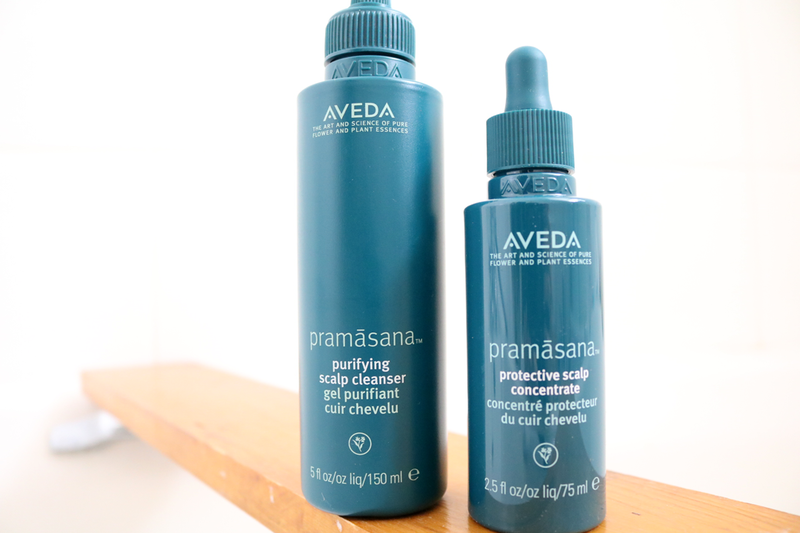 A healthy scalp is essential if you want strong and healthy hair, but it's often an area that most people don't really talk about or spend much time on, which is why I've been so excited about Aveda's new Pramāsana range. I have a sensitive scalp that gets easily irritated to the point where it can sometimes be unbearably itchy and flaky during really bad flare-ups (I've discovered that these bad times are often linked to seasonal changes, dealing with too much stress and when my eczema plays up). It's not a pretty thing to imagine and it can be a real confidence killer, but it's a very common problem for many people. Whilst I'm working on my coping mechanisms for dealing with stress, I've found that using SLS-free hair care has helped me enormously, and I'm sure my regular readers will have spotted numerous SLS-free haircare reviews on here for that very reason! 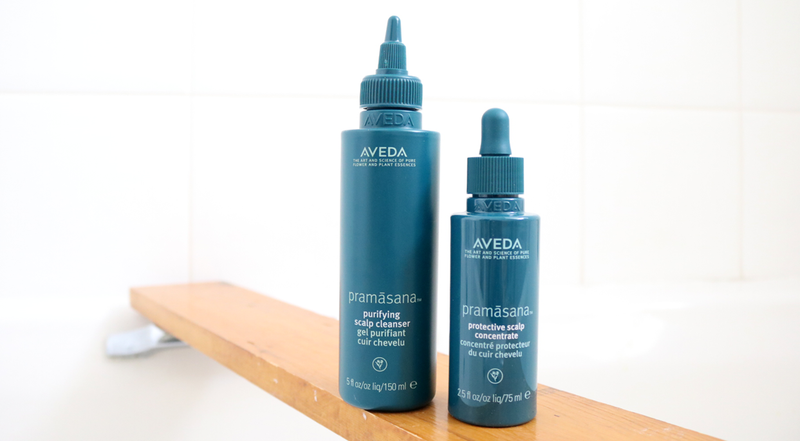 I've experimented with various scalp treatments and oils over the years, and although I've had the most success with using Philip Kingsley's Scalp Toner, it still hasn't completely solved my problem, so I was interested in trying Aveda's new Pramāsana range as soon as it launched. The Pramāsana range is basically a three-step targeted system that gives the equivalent of a facial to your scalp. It deeply exfoliates, cleanses and balances, giving it that extra TLC that a sensitive scalp so often needs. Used as a cleansing treatment before you shampoo your hair, this Purifying Scalp Cleanser is made from 98% naturally-derived ingredients and features Wintergreen derived Salicylic Acid to deeply exfoliate the scalp. It removes any build-up from styling products, dead skin cells and helps to rebalance any excess sebum, so it's a good one to try if you hit the gym a lot or like to do hot yoga! To use it, I apply a small amount directly to my scalp all over, making sure that I cover the top of my hairline which is where I get itchy and flaky the most. Once applied, I massage it in, where it starts to lightly lather up (in an SLS-free manner of course) and it feels so nice and cooling when I do this! There's no leave on time with this, so I head straight into the shower, rinse with warm water and shampoo and condition my hair as normal. The next and final step after you've finished shampooing and conditioning is to apply the Scalp Concentrate which contains 96% naturally derived ingredients and feels like a protective skincare serum, but for your scalp. It has a handy dropper applicator and the concentrate feels ultra-lightweight so you can use this on towel-dried, damp or dry hair, without it making your hair greasy (if it does this, you'll definitely using way too much!). The concentrate works to penetrate the surface layers of the scalp in order to nourish it, and it helps to support the scalp's natural protective barrier, which in turn helps to further protect it from pollution and other irritating free radicals. To use, I part my hair and apply it directly to my scalp like I did with the cleanser above, and very gently massage it in. You only need to use a tiny amount as the formula is so concentrated and as it's a leave-in treatment, you can just style your hair as usual afterwards and you're done. As I mentioned earlier, I've been using these products for just over a month now and I've already seen a big difference in how my scalp is looking and feeling. It's a lot less itchy and flaky, and feels clearer and cleaner than it's ever been before. Really impressed, and I look forward to seeing what the long term results are like - watch this space! The Aveda Pramāsana range is available from all Aveda stockists and salons nationwide, and online at aveda.co.uk / There's also an In-Salon Scalp Facial Treatment available (from £50), so contact your local Aveda salon for booking info. Have you tried this new range yet?